This post is rather tardier than usual, but in all honesty I’ve hardly felt like I’ve done anything other than work at my job, work on my thesis, and plan my wedding all summer. On the up side, I’ve been making decent progress on the thesis research. This has been helped by using my vacation time from work as dedicated thesis time. Even when I went to visit the fiancee in Philly/New Jersey, I got a good 4.5 days of thesis work in while she had to work during the week. Oh! That’s right. International travel. That is something, at least. 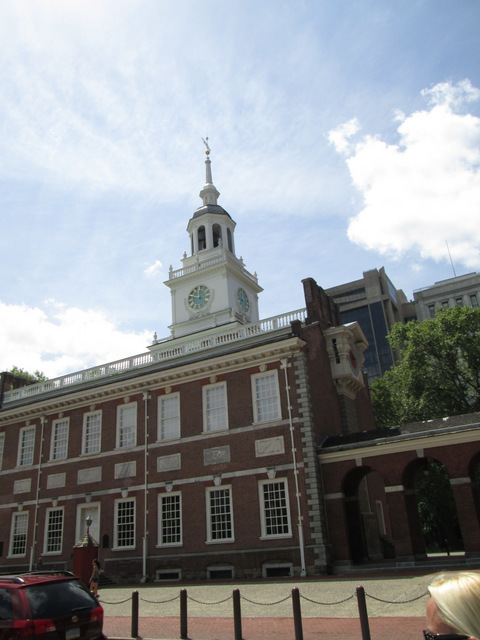 I finally got to see some of the historic sites around Philadelphia, like Independence Hall and the Liberty Bell. Look! There are pictures! 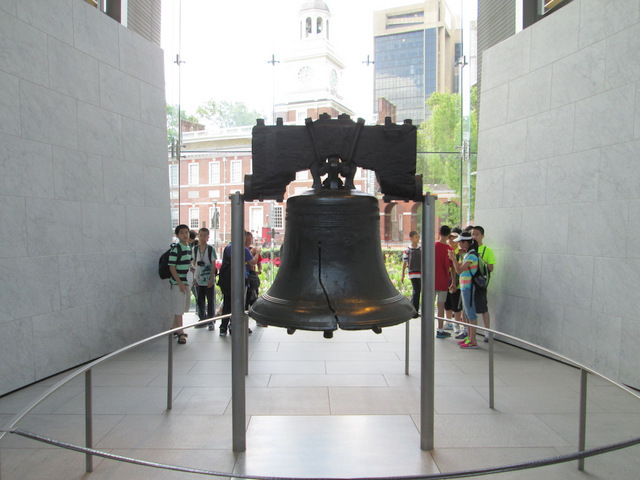 Liberty Bell. No licking allowed. We then spent some time in New Jersey while the fiancee was at work during the week. We did pop over to New York City one night. I have proof! New York. 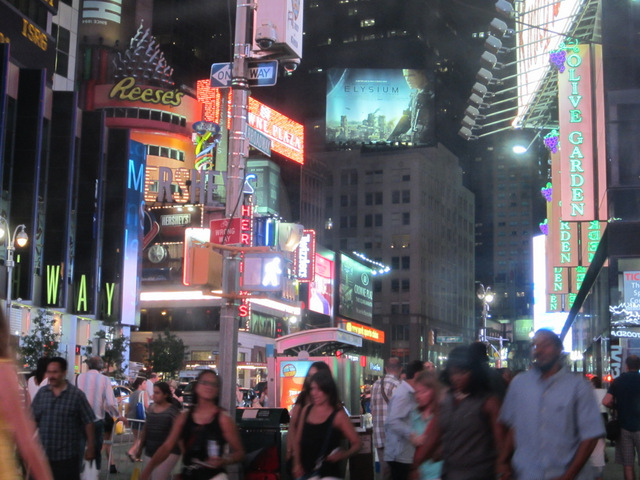 Probably Times Square, or somewhere near there. We had decided to see a Broadway show, so we looked at what was playing at a time that was convenient (and had good reviews), and so—knowing absolutely nothing about it—went to see Once. This turned out to be an excellent—if somewhat low-key—show, but was made all the more exciting because it was starring Arthur Darvill (Rory from Doctor Who!) and the dude could sing! Possibly even more exciting than that, we also found a Lego Store in the Jersey Gardens Outlet Mall in Elizabeth, New Jersey. There was so much Lego! I wanted to roll around naked in it, but that would be both painful and frowned upon. That outing also saw a visit to White Castle, which was okay, but not as life-alteringly transcendant as I would have hoped. 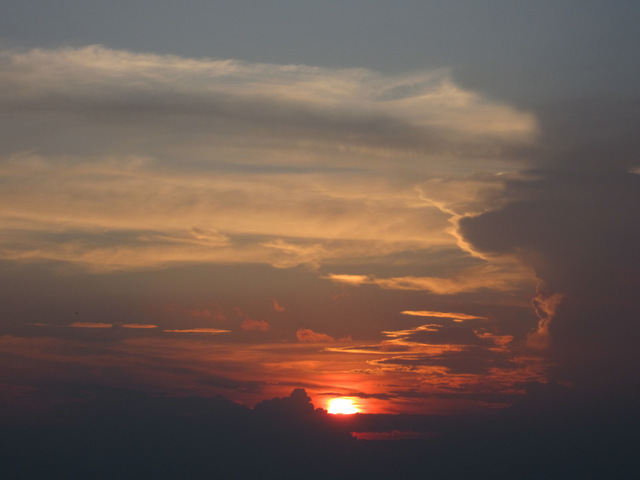 At the end of that week, we headed up to the Jersey Shore. We actually didn’t make it to the boardwalk area, so it was really rather nice. I have proof! The nice part of the Jersey Shore. We also took in RED 2, which was quite well executed by the charming and awesome cast, but perhaps fell a little short of generating the excitement of the first one simply because it was no longer a novel concept. As such, it didn’t feel quite as good, though it was certainly not a disappointment. Okay, so July was actually pretty eventful. Maybe that is my excuse for being tardy. I have already talked about Greco, but recently they had a special that was so ridiculous I had to try it. As expected, it proved worthy of its own post. From the photo, I’m sure you’re all thinking, “That must be a stuffed-crust pizza.” And you would be right. But also so very, very wrong. For look upon what is revealed once a slice is removed! That’s right. It’s a stuffed pizza pizza. The entire inside of the pizza has toppings throughout, and then it’s like another pizza was slapped down on top. 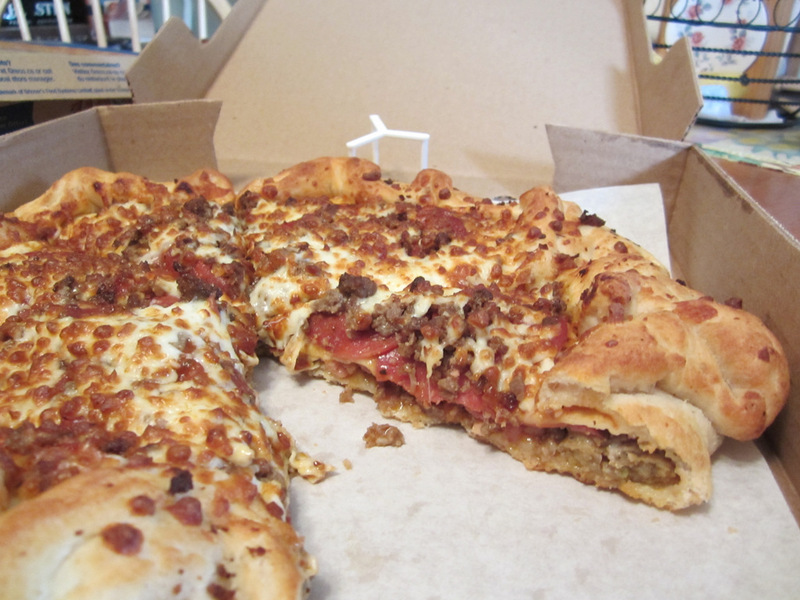 It should come as no surprise that I went for the six-meat variety of Double Decker pizza. Much like the oft-maligned KFC Double-Down, this was so ridiculous that I had to try it. And like said ridiculous foodstuff, it turned out to be a bit disappointing. I mean, it tasted good in my mouth, and I’m glad I tried it, but I probably wouldn’t do it again. My Double Decker experience did offer some crucial insight into pizza, however. Its key drawback, I felt, was the drastically imbalanced ratio of toppings to crust. There were bites where all I could taste was ground beef, because the middle toppings leaned heavily in that direction and the top and bottom layers of crust were so very thin—I might as well have been eating a hamburger instead of a pizza. Now, I loves me a hamburger, but it is not pizza and not an equivalent experience. That was the insight. The importance of balancing all the aspects of the pizza: crust, sauce, cheese, toppings—if any one of these drastically overpowers the rest, then it doesn’t really come across as pizza. The delicious awesomeness of pizza is in the balancing of those factors against each other. All in all, I would have preferred a regular Greco pizza to the Double Decker, but now I know. And knowing is half the battle. First of all, some of my few readers may be familiar with her because she has been writing the West of Bathurst webcomic (linked from my sidebar) for the last seven years or so. In the midst of recent server troubles which eventually saw me helping her migrate the site hosting, she/the comic got nominated for an award! Specificially, the Aurora Award, for “Best Graphic Novel – English”. Yes, she was also nominated for “Best Fan Filk”. (That’s a kind of music.) Kari writes and performs geeky songs, and has finally actually recorded some and released some of her stuff on not one but TWO albums! (Okay, so the first album, Pirate Elves in Space, is a collaboration, but it has 3 of her songs on it.) Her album Beowulf Pulled My Arm Off even got a mention on SF Signal, a popular science fiction/fantasy/horror blog. You can listen to her stuff at those Bandcamp links, or find her YouTube channel. If you enjoy nerdy folk music—or think you might—you should definitely check out Kari’s work. Anyway, that’s about it for my shameless friend-promotion. I will endeavour to check in again soon with another movie update—we’ve started the summer season. After the tragic Stoggers fiasco at work (where we ordered at 11:30 AM, the pizza didn’t show up till 3:30 PM, and they only offered a 10% discount) we had to cut them from the Pizza Friday rotation. The first viable alternate suggestion was Hobo’s Pizza, and so we tried that. It… wasn’t bad. It wasn’t great, but it wasn’t bad. As I recall, the crust didn’t have much flavour to it on its own, but with the toppings the pizza was okay. The key attraction of Hobo’s—and the reason it has stayed on the list—is the crucial value-for-money proposition. We got a ridiculous amount of pizza for significantly less than our normal price. The pizza may only be okay, but it is cheap and plentiful. That can be a potent combination. While it is nowhere near being a favourite, you do get some decent bang for your buck. I recently managed to convince a somewhat reluctant friend to go see Jack the Giant Slayer with me. Though that friend enjoyed herself and offered praise such as “actually an okay movie” amongst other contortions to avoid actually saying she liked it, I hold no such reservations. It was a good movie and I liked it. I mean, the script was rather corny in parts, but it tied together a lot of the different aspects of various Jack and the Beanstalk legends in an enjoyable story. The cast was solid and suitably over-the-top when called for, and it was refreshing to see a fantasy story where the king (Ian McShane) was not corrupt or evil and the captain of the guard (Ewan McGregor) was actually competent at his job. The chemistry between Jack (Nicholas Hoult) and the Princess Isabelle (Eleanor Tomlinson) was believable, and I liked that neither of them was played as stupid. While the plot was set into motion by some unfortunate coincidences, it did not rely on the main characters acting like idiots to keep it going. All of which is to say this was not a brilliant piece of filmmaking, but simply a well-done movie. It didn’t blow my mind or anything, but it didn’t disappoint or dissatisfy, either, and in this day and age I consider that a major accomplishment. During one of my recent (increasingly infrequent) visits to the gym, I noticed that a new pizza place was rising from the ashes of a former Blockbuster video location: Greco Pizza. In this context, “new” is a relative term—I seem to recall that there used to be a Greco somewhere else in St. John’s, but there hasn’t been for a while. They do appear to be a fairly significant chain, however, with over 100 locations throughout Atlantic Canada and Ontario. Anyway, I took advantage of a current special (a large with 3 toppings for $15) and got a pizza for dinner tonight, with cheese, pepperoni, bacon, and ground beef. Initial impressions were good: the toppings were abundant, I saw it come out of the oven so I knew it was fresh, and it was not overdone. asting it was just as encouraging—it was a good pizza. Unfortunately, I don’t think it was the right kind of pizza. Greco pizzas are pan pizzas reminiscent of Pizza Delight or Pizza Hut. As such, it was a little greasier than I’d care for in my perfect pizza, with a soft crust where I tend to prefer a little bit crispy. Furthermore, they tout their “edge-to-edge” toppings, whereby the toppings are spread over the entire top of the pizza, and indeed this was the case. I, however, like a bit of firm crust accessible around the edge so I have something to hold on to. The restaurant site itself was clean (not surprising, giving that it has been open for less than a week), with a lot of people in the kitchen efficiently producing pizzas. While I expect this would bode well for the consistency and reproducability of Greco’s pizza, it also homogenizes the experience a bit and makes it feel just a tad too generic. Looking back, I realize this sounds rather negative, and that is certainly not my intent. The pizza was quite delicous, and I had six slices eaten before I realized that I should probably not eat six slices. It is good without being the type of pizza that is my ideal, but I can hardly fault it for that since it aspires to be something different. While the Pizza Quest will continue, I will still be happier now that there is a Greco nearby. I know it is hard to believe, but things around here have been quieter than usual lately. I’m far behind on my movie posts (and, frankly, far behind on seeing movies), I haven’t finished reading any books in ages, and I’m afraid I may be running out of prominent pizza places to feature in my Pizza Quest. It is possible that I could have caught up on or dealt with some of these issues over the past month or so if not for a few of exciting events. The girlfriend was upgraded to the fiancee. (Actually, so was I, now that I think about it.) I proposed in Vegas on New Year’s Eve with the help of her sister and friends, and took her completely by surprise. Since then we have been rather busy nailing down details of when and where the event will happen, and that has taken up a surprising amount of time. I was on TV! Last September, the Daily Planet show on the Discovery Channel filmed a segment about our research project at work, and it finally aired. We are in Part 1 of the January 24th, 2013 episode, which I seem unable to find online right now but was definitely there yesterday. All of the above kept me rather busy and distracted. However, now that I’ve settled into a nice routine with work, wedding planning, and thesis, I’m hoping I can fit in more time for blogging and other fun stuff too. As I am travelling now at the end of December, there will be no regularly-scheduled last-minute blog post with actual content. Just a picture, because I am in Las Vegas! 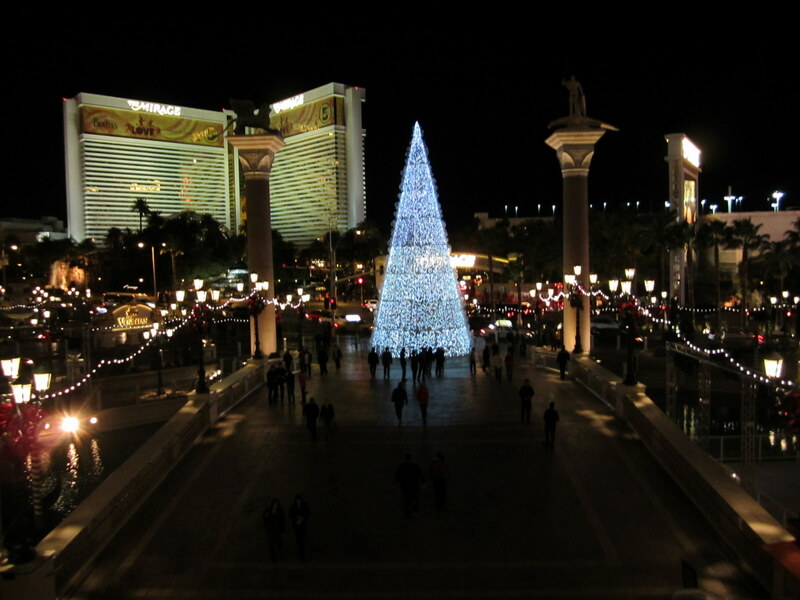 The view from the front balcony of The Venetian, with The Mirage (my hotel) in the background on the left. Earlier that day I also took a trip down to the Hoover Dam, which, I have to say, was pretty damn cool. 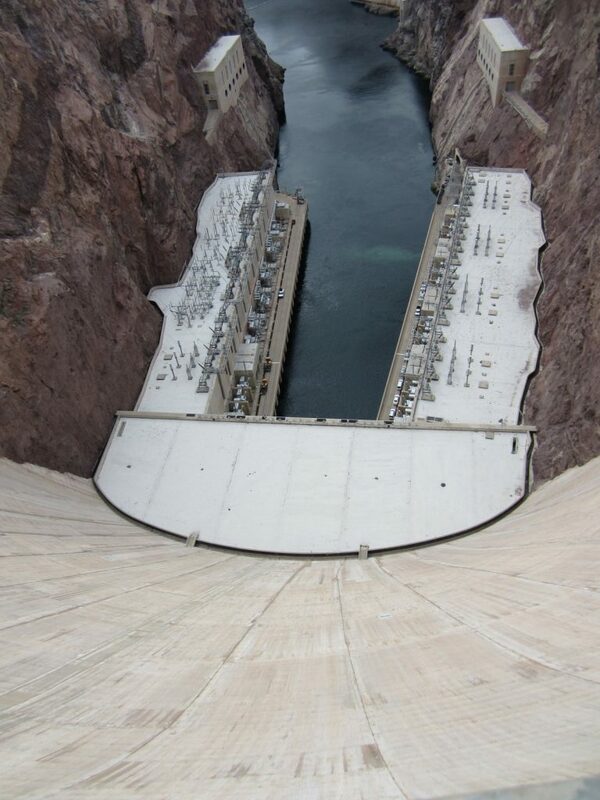 The view from the top of the Hoover Dam, that conveys just a bit of how big it actually is. So long until 2013! And, though it may be a bit early, Happy New Year! This entry has been a source of great consternation for me. My cousin—an avid follower of my quest—had suggested trying The Big Cheese, but as it was located a bit far away from me, I hadn’t gotten around to it. Then, one Friday, lo and behold, it came up as a suggestion when another place was unable to deliver, and so we went for it. The results… were mixed. At our Friday pizza lunches, garlic fingers are typically ordered to accompany the pizza. I usually have a couple of small ones out of a sense of duty, but they are really not my thing. I am all about the pizza. The garlic fingers we had from The Big Cheese, however, struck me as especially awesome. Topped with cheese and bacon, they just totally hit the spot, the right mix of flavour and texture and deliciousness. I think I had four large ones. The pizza, though… the pizza was a disappointment. It looked promising, initially: ample cheese, generous amounts of ground beef, pepperoni, and other toppings. The crust appeared a little on the thick side, and a bit dark—perhaps it was a tad overdone. Unfortunately, the taste did not live up to the looks. 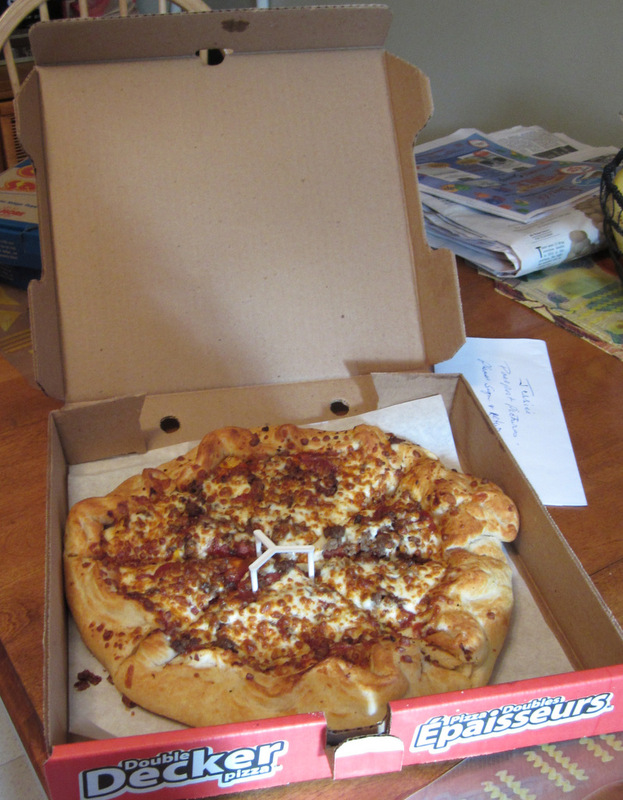 The toppings tasted fine, but the sauce was not noticeable and the crust basically had all the flavour of cardboard. I want to stress that the crust didn’t taste bad. Rather, it seemed to have no taste at all. Eating a slice of pizza was basically like eating a handful of pizza toppings with some flavourless filler material. I just don’t understand how the garlic fingers could be so good—the best we’ve had at work, in my opinion—and yet the pizza could be so bland and dissatisfying. I mean, they’re basically the same thing! In an attempt to get to the bottom of this I may try them again in the future, on the off chance that it was a one-off bad pizza. Of course, it being a one-off bad pizza would not factor well into its consistency rating—reproducibility is key to a good pizza place, and certainly to the place that will become “The One”. There has been a lot of pizza-related activity lately, thanks to Friday pizza lunches at work. We have embarked on a Pizza Quest of our own, there, and so it has afforded me the opportunity to sample a few more new places. Today’s entry is—I think—Pizza Empire. (I had been thinking it was called Empire Pizza all along, but Google can find no such place.) I am told that it is the best of the pizza places found in the Empire Avenue cheap pizza district, but—not having sampled the others—I cannot verify this. I can verify that it was cheaper than most of our usual places. The quality… wasn’t bad. Toppings were reasonably generous, but I felt the crust was overdone and a bit tough. The size of the pizza was quite generous and crust thickness was mid-range, neither too thin nor too doughy. Overall, it tasted fine but didn’t stand out for me. I would certainly eat it again, but there are several prior entries in the Pizza Quest that I vastly prefer.